Mike Ullery | Daily Call David York of Russia looks to clear the bar in the boys Division III high jump event. Mike Ullery | Daily Call Lauren Heaton of Russia crosses the finish line in the girls Division III 400 meter dash. Mike Ullery | Daily Call Leah Francis of Russia runs the Division III 100 meter hurdles prelims at Jesse Owens Stadium in Columbus on Friday. 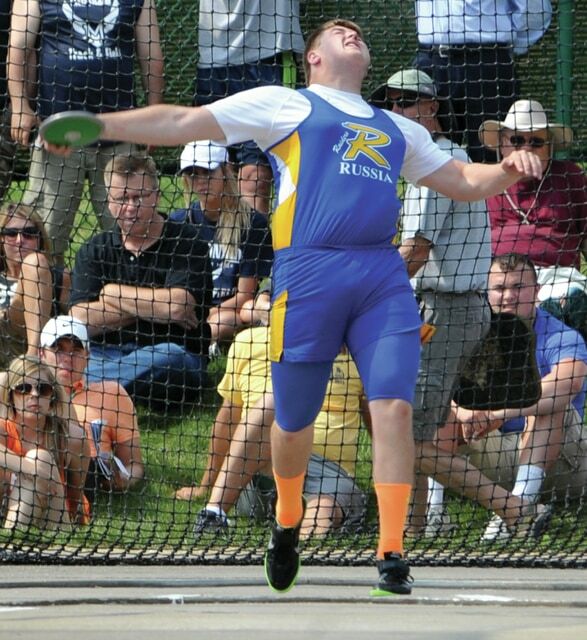 Mike Ullery | Daily Call Nick Colby of Russia throws the discus in boys Division III competition on Friday. COLUMBUS — David York — couldn’t have asked for anything more than the way he ended his career at the D-III state track and field meet Friday at Jesse Owens Stadium on the Ohio State University campus. Nick Colby, like York a Russia senior, was hoping for a little more. York saved his best for last, taking sixth in the high jump, while Colby was seventh in the discus. And it was two clutch jumps that got York to his final position. Having never cleared 6-4 before, York was down to his third attempt at that height and had to clear it to get to the podium. He did exactly that and then made 6-5 on his second attempt, when he brushed the bar, but it remained up. He was close on his attempts at 6-6. Colby, who hadn’t lost all year before finishing second at the regional meet with a throw of 162-9, was hoping for a similar performance Friday. His best throw of 154-2 didn’t come until finals. Colby showed marked improvement in the finals. The positive for Colby was to end his career on his podium. The Russia girls had started the day with a fifth-place finish in the 3,200 relay. The foursome of Shaelynn Goubeaux, Grace York, Emily Borchers and Lauren Heaton’s time of 9:32.62 becomes more impressive when you realize it was faster than they ran when the Lady Raiders were state champs two years ago. “School record, state medal — you can’t ask for anymore than that,” Heaton said after moving the Lady Raiders up from seventh to fifth on the anchor leg. Goubeaux started the Lady Raiders off in solid position. Fellow sophomore York kept the Lady Raiders in solid position. Emily Borchers, like Heaton a member of the state championship team two years ago, moved Russia up to seventh and gave Heaton a chance to make a run. Leah Francis is looking to improve on two straight fourth-place finishes in the 100 hurdles and got off to a good start. She won her heat of the 100 hurdles in 15.30 and the Lady Raider senior has the second fastest time going into Saturday’s finals. Heaton is the defending champion in the 400, but came in with just the fifth fastest time. And she qualified with the fifth fastest time of 58.38. The 1,600 relay (Francis, York, Borchers, Heaton) also advanced with the ninth fastest time of 4:05.98. Borchers and Molly Kearns will run in the 3,200 today for the Lady Raiders as well. Just like the Raiders start. Rob Kiser is Sports Editor for the Daily Call. He can be reached at (937) 451-3334.